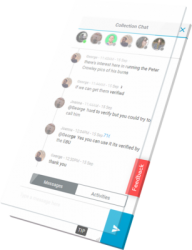 Truly Media is a unique web-based collaboration platform. 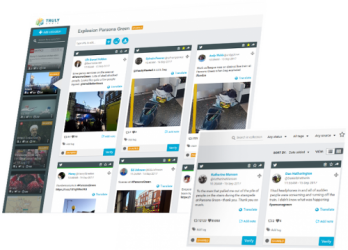 It has been designed to support the verification of digital (user-generated) content residing in social networks and elsewhere. Truly Media (www.truly.media) was developed in very close collaboration with journalists and human rights investigators, taking their demands and requirements fully into account. Use Truly Media – or your own trusted and established ways and tools – to find content from a variety of sources. Bring everything together in one place: a Truly Media collection. 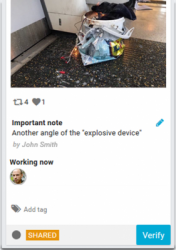 Organize your content and share your work and findings in real time with colleagues anywhere in the world, across time zones and organizational barriers. Verify together, in real time. Exploit a toolkit of the most effective internal and third party verification tools that support you in gathering information and making decisions. 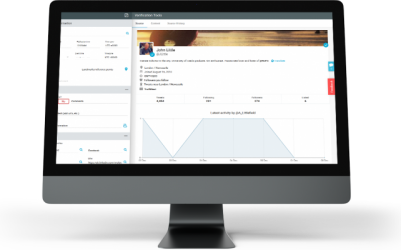 Create streams to monitor social media content aggregated from a variety of sources like Twitter, Facebook, YouTube and others. Use a set of advanced filters to make the discovery easier. Create common workspaces and define working teams to organize the work and particular tasks inside your organization or team. Take advantage of the various display and search options to quickly move through collection items. 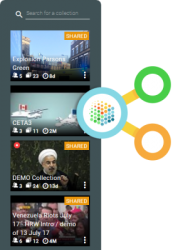 Move content of interest via “drag and drop” from streams into a collection, or use a browser extension to import content from social networks to a collection. You can also upload media files from your hard drive (e.g. images you were sent or material you collected in closed networks) or paste the link of any social media item or website so it becomes part of a collection and is available for further investigation. 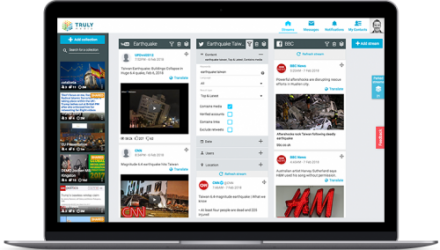 Work collaboratively with other journalists to verify photos, videos, text, and social media accounts in real-time. Use a set of notification channels (email, instant chat, Slack) in order to make sure that you don’t miss anything of importance or relevance for your task. Don’t stay isolated. Get connected with other organizations and professionals to create a powerful network of verification experts. Share your verification work and knowledge with them, and join forces to monitor and verify claims appearing online. Groups can be created on a topic basis. 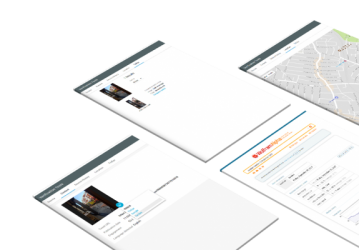 Adapt Truly Media to your business logic by using a set of available properties for each item. Add quick notes, enrich with tags, set priority levels or change assignee for any item in your collections. Drill into item details through different visual representations and diagrams. Check the source history, translate textual content, extract links and media items to get a quick and rich overview of any item. Google Maps, TinEye, WolframAlpha, Google Reverse Image Search, Yandex, Snopes, Pipl and many more tools are available to you. Make your life easier by having a selection of powerful and highly useful tools for verification integrated into the Truly Media platform, to verify as seamlessly as possible, and have them at hand at the “click of a button”. Follow the verification checklist structure to make sure you have collected every important piece of information needed to make a final decision on the veracity of a content item. This can be done individually or collaboratively by a group of people, in real time. Everyone can see at any time what information others have contributed. Define the verification status and publication information for an item. All your work is safely stored, easily searchable and fully transparent. You can always go back in time and track the history of any verification action inside Truly Media. 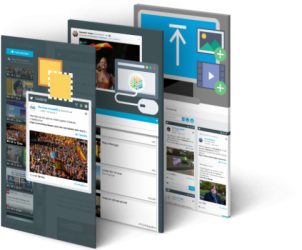 Ingenta Editorial – an all in one editorial, digital asset management & cross channel publishing platform.